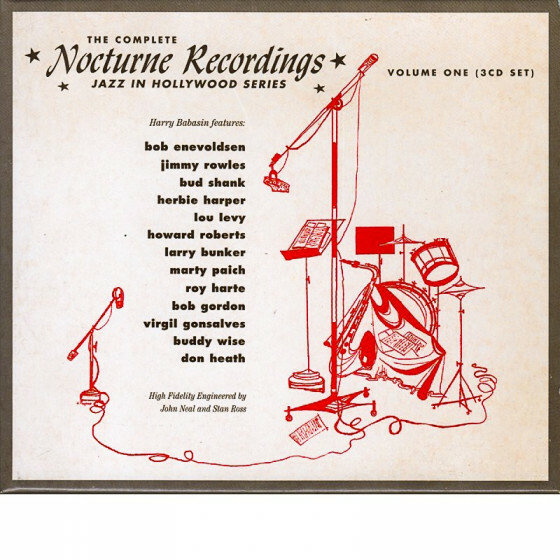 The founders of the Nocturne label, Harry Babasin and Roy Harte originally conceived THE COMPLETE NOCTURNE RECORDINGS - JAZZ IN HOLLYWOOD SERIES in 1954 during the "vinyl" era. They had intended to release a collection of unreleased sessions and rehearsal dates as a large boxed set of 10" LPs!! With the advent of CDs, lack of funding, the pair soon nixed the "vinyl" idea but the dream lived on even after the passing of producer and bassist Harry Babasin in 1988. Fueled by the determination of Roy Harte and several other musicians close to the original concept, this CD collection of those unreleased sessions and rehearsals made between 1954 and 1955, have now been compiled and produced by Jordi Pujol. Digitally remastered and re-issued in 1998 by Fresh Sound Records, this 3-CD box set contains priceless memories of jazz in Hollywood and features some of the greatest musicians of the 50s, an 84-page booklet containing reprints of articles, reviews, candid photos, original album cover art, and enough music to keep you happy on that proverbial "desert island." The original producers, Roy Harte and Harry Babasin, launched Nocturne Records right in the middle of Hollywood, California to begin a series of new recordings that were to be called "Jazz In Hollywood." 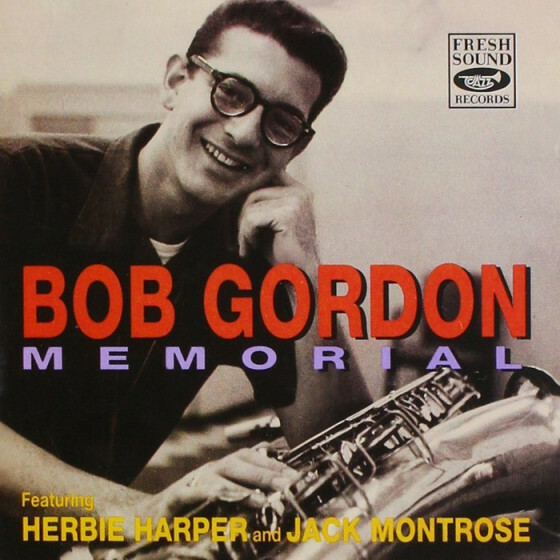 They wanted to feature local musicians to give further credence to the existence of a "new Hollywood jazz school" so Nocturne Records introduced Herbie Harper, Bob Gordon, Bud Shank, Marty Paich, Jimmy Rowles, Howard Roberts, Bob Enevoldsen, Lou Levy, Larry Bunker, Virgil Gonsalves, Buddy Wise and saxophonist Steve White. Harry Babasin told DOWNBEAT in an interview in 1954: "There is very definitely a recognizable new school of jazz that has gradually come into existence here during the past couple of years. It stems from the fact that so many authentic jazz musicians with solid musical backgrounds and training are established here more or less permanently. We don't move around as much as musicians in other parts of the country." Who says, West Coast Jazz doesn't have roots!! 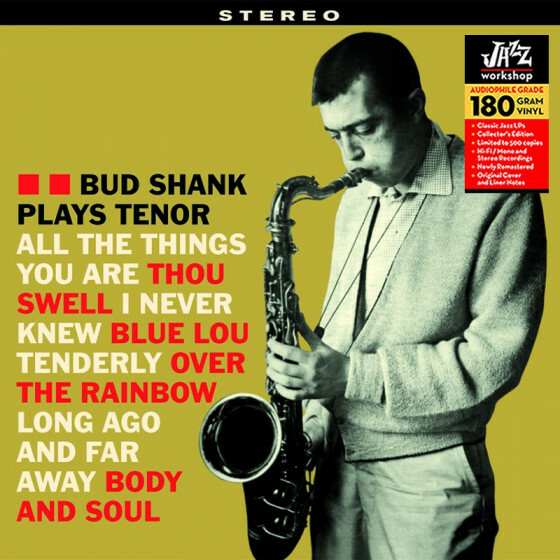 Disc One features the Herbie Harper Quintet, the Bud Shank Quintet and the Harry Babasin Quintet playing an astounding range of styles on 19 songs. From Straight-Ahead to Swing, such songs as "Summertime," "Jive At Five," and "Skylark," stimulated the quintets to discover and play the very essence of West Coast Jazz in a way we haven't heard in subsequent years. Disc Two features the Bob Enevoldsen Quintet, the Herbie Harper Quintet and the Virgil Gonsalves Sextet on 22 fabulous songs. They pass the "Fast Buck," swing on the hit made famous by Mel Torme, "Lulu's Back In Town," add a little "6/4 Mambo" and "Bounce" "Out of Nowhere." It's just "Too Marvelous For Words!" 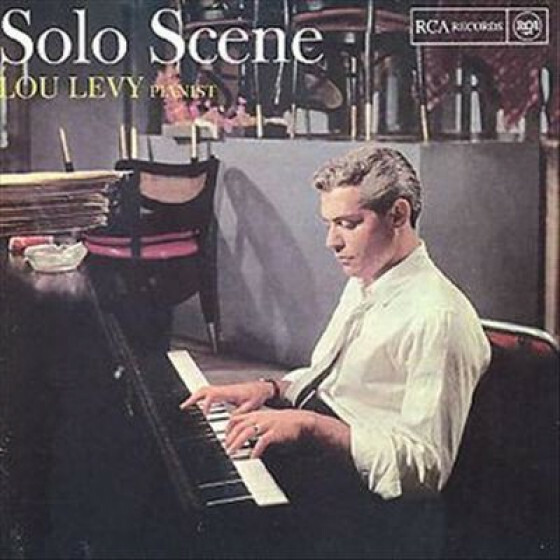 Disc Three features the Lou Levy Trio and the phenomenal Jimmy Rowles Trio on 19 great songs. Jimmy Rowles, Red Mitchell and Art Mardigan are great on "Let's Fall In Love," "All The Things You Are," and his ever famous, "Topsy." He was well-loved during his heydey and the Mayor of Los Angeles went so far as to proclaim "Jimmy Rowles Day" at the height of his career. This CD concludes Volume One of the series. The tenacity of Harte and Babasin paid off. With Harte on drums and bongos on over 35 sessions and Harry Babasin on bass and cello on 49 sessions, you, dear listener will be astounded at the consistency of their work on this monumental collection of great jazz works. The COMPLETE NOCTURNE RECORDINGS, JAZZ IN HOLLYWOOD SERIES - Volume One is a valuable collection of vintage recordings by some of California's finest musicians and an excellent introduction to the history of West Coast Jazz. Herbie Harper (trombone), Bob Gordon (baritone sax), Jimmy Rowles (piano), Harry Babasin (bass), Roy Harte (drums). Shorty Rogers (flugelhorn & trumpet), Bud Shank (alto flute & alto sax), Jimmy Rowles (piano), Harry Babasin (bass), Roy Harte (drums). Harry Babasin (bass & cello), Bob Enevoldsen (valve Trombone & bass), Jimmy Rowles (piano), Larry Bunker (vibes), Roy Harte (drums). Bob Enevoldsen (valve Trombone & tenor sax), Howard Roberts (guitar), Marty Paich (pìano), Harry Babasin (bass), Don Heath (drums), Roy Harte (bongos on #3). Herbie Harper (trombone), Bud Shank (tenor & baritone sax), Marty Paich (piano), Harry Babasin (bass), Roy Harte (drums). Herbie Harper (trombone), Al Hendrickson (guitar), Harry Babasin (bass), Roy Harte (drums). 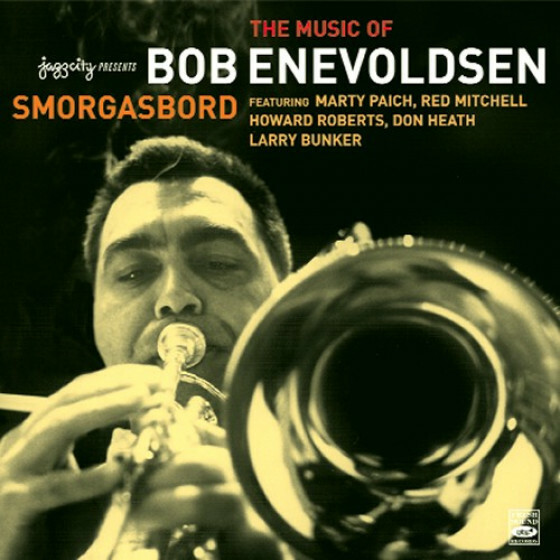 Bob Enevoldsen (valve Trombone), Buddy Wise (tenor sax), Virgil Gonsalves (baritone sax), Lou Levy (piano), Harry Babasin (bass), Larry Bunker (drums). 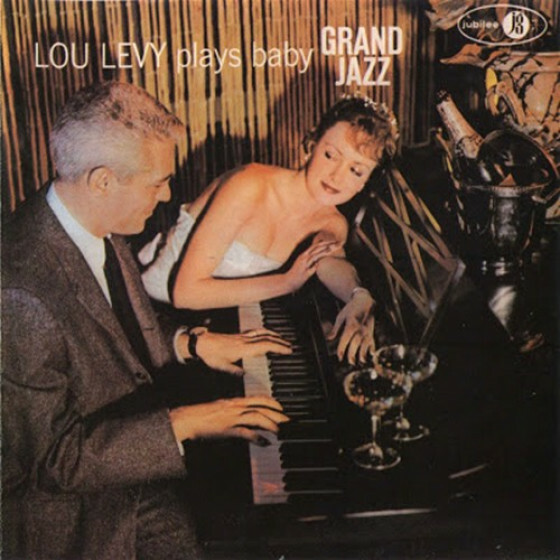 Lou Levy (piano), Harry Babasin (bass), Larry Bunker (drums). Jimmy Rowles (piano), Red Mitchell (bass), Art Mardigan (drums). "In 1954, bassist Harry Babasin and drummer Roy Harte founded Nocturne, a label based in Los Angeles that during the next two years would document some of the top local musicians in its "Jazz In Hollywood" series. While Pacific Jazz and Contemporary were the leaders in the field, Nocturne also had something of its own to offer, and its cool jazz-oriented recordings were consistently rewarding. After the label inevitably folded, some of the albums were released by Liberty, while others were bootlegged; in more recent times V.S.O.P. and the Original Jazz Classics series have issued a few of the sessions. This 1998 three-CD set from the Spanish Fresh Sound label is quite definitive. Its thick 84-page booklet tells the story of the label, has the original liner notes, includes latter-day comments from surviving musicians, and even has Downbeat reviews from the 1950s, along with dozens of priceless photos. Most importantly, all of the music from eight complete albums (which were mostly 10-inch LPs) are reissued in full, as well as a couple of previously unreleased numbers from the Jimmy Rowles session. The most exciting performances are on the first disc: a quintet set featuring trombonist Herbie Harper and the talented if short-lived baritonist Bob Gordon, a showcase for Babasin's pioneering jazz cello solos, and altoist Bud Shank's debut as a leader. 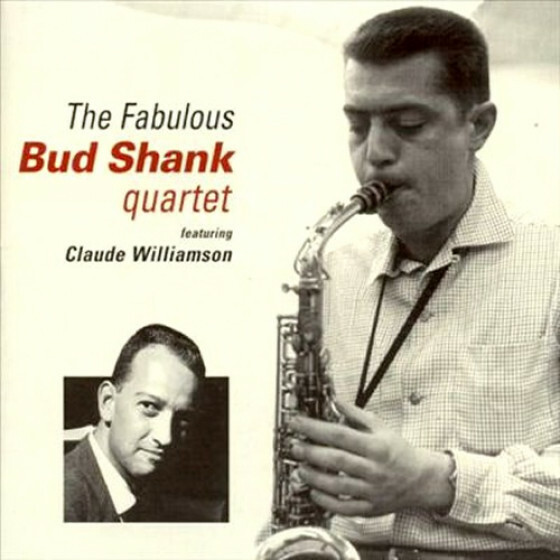 The latter finds Shank and Shorty Rogers (whose flugelhorn playing on this date was among the first on that instrument in a modern jazz setting) performing six of Shorty's originals, including the memorable "Casa De Luz" and "Lotus Bud." Other sessions are headed by Bob Enevoldsen (who doubles on valve trombone and tenor), trombonist Harper (some of his numbers find Shank on tenor and baritone), obscure baritonist Virgil Gonsalves, and trio outings by pianists Lou Levy and Jimmy Rowles. While West Coast jazz has often been ignored or given superficial treatment in jazz history books and by East Coast critics, the music on this highly recommended set (and the ones to follow) shows just how swinging and rewarding the idiom really was."